These Patriotic Wave Banners Stand Above the Crowd at 14ft Tall! This Ensures Your Advertisements Will be Noticed! Patriotic Wave Banners are also Priced to Sell! Pre-printed graphic on a single side (dyed through) with mirror image on back side. 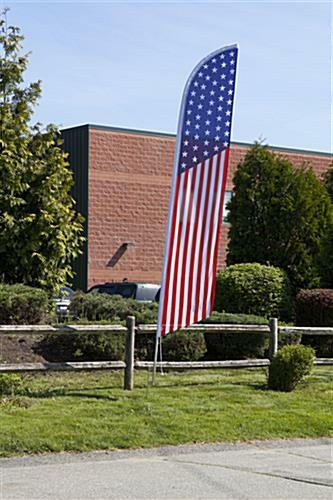 14' Height flag with red, white, and blue color scheme for a brightly display. Patriotic Wave Banners -"American Flag Pattern"
These patriotic wave banners that are for outside use flutter in the wind for an eye catching effect. 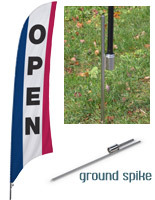 This USA flag display includes a metal ground spike that can be reused and relocated as desired. These stars and stripes patriotic wave banners can be set up in minutes. This feather flag is economical for small business seeking higher exposure. These patriotic wave banners that are ideal for businesses can be placed by the roadside to grab the attention of passerby customers. 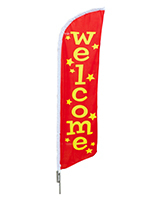 This signage pennant has a pole sleeve so users can simply slide onto the aluminum pole. These patriotic wave banners are portable and can be taken down at night or during inclement weather. This USA swooper is printed on a poly knit material for vivid coloring and durable outdoor use. 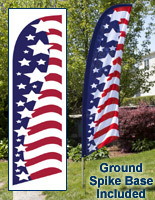 These patriotic wave banners have a stay open design so the usa colors pattern is always visible with or without wind. This signage is inexpensive! These red white and blue patriotic wave banners, also known as USA business message flags, are perfect for promotional events or holiday sales. 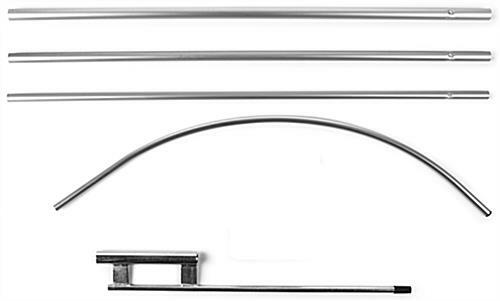 These feather shaped displays include a 4 piece aluminum pole that is a fraction of the cost of fiberglass. 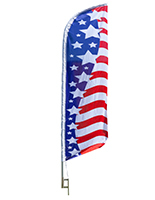 These USA flag feather swoopers, patriotic wave banners that are attention grabbing are offered at wholesale prices! This USA flag display does not include a nylon carrying bad as do the "deluxe" models. 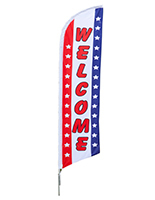 These patriotic wave banners are colorful eye catchers that draw in customers. This display is universally recognized as a special event flag which is sure to increase traffic in any businesses establishment.